LONG BEACH, CA, Dec 14, 2016 – Epson America, Inc., a leading provider of digital imaging solutions, introduced two new home and office organization solutions – the WorkForce ES-400 and ES-500W duplex document scanners. The compact, yet powerful ES-400 and ES-500W scanners boast speeds up to 35 ppm/70 ipm1 and feature a 50-page auto document feeder (ADF) for fast scanning. Both models enable users to scan to online storage accounts2 including DropBox, SharePoint, Evernote, Google Drive and more. In addition, the ES-500W includes wireless capabilities3 for scanning directly to smartphones, tablets or computers. The new scanners include TWAIN drivers for simple integration with virtually any document management software, enabling businesses to save time and money by directly scanning files into their existing workflow. The ES-400 and ES-500W make document organization quick and easy, with single-step duplex technology that scans both sides of virtually any paper, quickly turning paper documents into searchable and editable files with the included OCR software. For users requiring a versatile solution, both models offer auto document size detection, which enables scanning of virtually any size documents including business and ID cards, single sheets, receipts, extra-long pages and more. In addition, each scanner is equipped with dynamic skew correction and double feed detection, preventing missing pages and jams for accuracy and reliability. In addition, the ES-400 and ES-500W utilize Epson Image Processing Technology for text and image enhancements such as auto crop, blank page and background removal. Both models are also equipped with a robust software package including Epson Document Capture, ABBYY FineReader and NewSoft Presto! Bizcard. The ES-400 and ES-500W can be connected to the network with an additional purchase of Epson’s Network Interface Unit (optional). 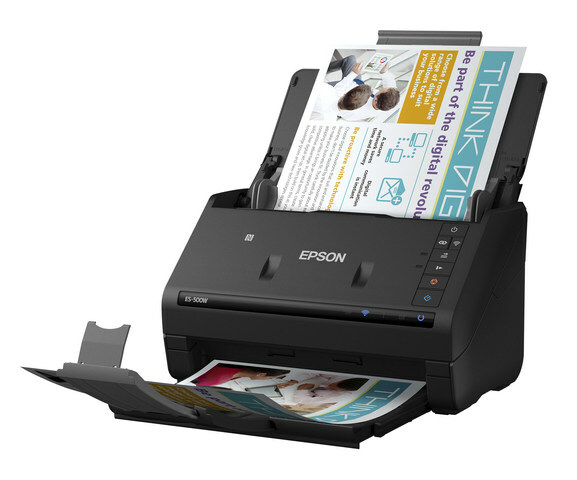 The Epson WorkForce ES-400 (MSRP: $349) and WorkForce ES-500W wireless (MSRP: $399) duplex document scanners will be available in mid-December through major computer, office and electronic superstores and online at www.epson.com. Both scanners feature a one-year limited warranty, along with optional extended service plan featuring next business day exchange programs. To learn more about Epson, please visit epson.com. 3. Wirelessly scan to smartphones or tablets (Android/iOS devices) via the Epson DocumentScan App; wirelessly scan to the cloud, PCs or Macs with Epson Document Capture software installed on the connected Windows PC or Mac.